East Sussex  is a county in the South East of England. Cuckmere Haven famed for its meanders. In prehistoric times, the whole of Sussex was populated by tribesmen, some of whom settled on the tops of the downs. Sites can still be seen at Firle Beacon, Mount Caburn and other sites. From the invasion in AD46 Sussex played a major role in Roman Britain. The Romans left Pevensey Castle and various Roman Roads as a reminder of their presence. In West Sussex Fishbourne Roman Villa remains a prime example of Roman houses in this part of the world. From the 5th–11th centuries, Sussex became the Kingdom of Sussex, controlled by a succession of monarchs. It was in East Sussex from where the Normans landed in 1066 at Pevensey, where they fought Harold's army at a field near Battle which can be visited to this day. Battle Abbey was built by the Normans after the battle. Most of the county churches had their first stones laid at this time. During the Middle Ages, a great number of Castles were built or improved on—Bodiam Castle and Lewes castle are prime examples. Most the Churches in Sussex date from this time and offer brilliant examples of Middle Ages architecture. Under the Tudors, Sussex prospered. Anne of Cleves House in Lewes is perfectly preserved with many examples of Tudor architecture. Hever Castle just over the border in Kent was frequented by Henry the Eighth himself. To ward against the Spanish, during Elizabeth's reign beacons were set up to warn of invasions, these live on as names, such as Ditchling Beacon and Crowborough Beacon. On Ashdown Forest iron working prospered, it is remembered today in the form of deep pools, once used to power the billows for the furnaces. In the 17th and 18th centuries, Brighton was transformed from a small fishing village to seaside resort, with the Royal Pavilion being a stunning example of the eccentricity of the King and his subjects. Elsewhere in the country, towns grew and great houses began to be built in Lewes and Rye. In the late 18th and 19th centuries, the Sussex coast became popular with Londoners escaping the city on the new railways. 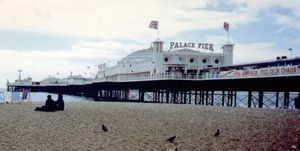 Brighton continued to grow with the expansion towns like Eastbourne and Hastings, which offer fine examples of period architecture. The Volks Electric Railway was constructed—the first electric railway in the world. Some great houses, such as Firle House and Glyndebourne were constructed (Glyndebourne is a popular and world famous opera venue). Great gardens were set up, like Sheffield Park near Uckfield. Sussex was not just a place for pleasure; it was a place for defense. Some of the most important military constructions include the Newhaven Fort and the Royal Military Canal in the east, with Martello towers built along the coast. These monuments remain in Seaford, Eastbourne and Rye. In the 20th century, Sussex played a major role in WWI and WWII; in both Newhaven Fort assisted with the D-day landings and as a naval base. Sussex has a varied and beautiful geography. From the stunning Seven Sisters Chalk Cliffs near Eastbourne to the flat marshes of Pevensey and the high Ground of Ashdown Forest to the beautiful lowlands and river landscapes of the Lower Weald. Sussex is the most forested county in England and lost in Friston Forest or Ashdown Forest (although much of it is open land) it is easy to believe. Often the only thing breaking the horizon is trees or the Downs. The country has a dense and varied network of footpaths (see East Sussex Footpaths) making walking easy, walking books and ordinance survey maps are easily available - there's really no excuse to go out walking! English - dialect is Home Counties. Speakers of other languages may have trouble being understood, but locals are often willing to be patient and multilingual dictionaries are available at book stores. Tourist information offices hold multilingual information. Speakers of English from other countries (e.g Canadians, Australians and Americans) should have no trouble at all understanding. 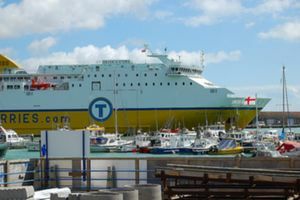 After a checkered history, ferries from Newhaven run to Dieppe (run by Transmanche Ferries  ) throughout the year, taking 4 hours. The A22, A/M23, A24, A26, A27, A272 and numerous other roads go into Sussex, destinations within Sussex include, Brighton, Lewes, Newhaven, Eastbourne. East Sussex is connected to the motorway network via the A/M23, which passes Crawley (in West Sussex) and south towards Brighton; from the A23 the A272 and the A27 - both offering great access to East Sussex; alternatively the A22 runs from London to just outside Eastbourne, passing by East Grinstead, Forest Row, Uckfield, Hailsham and Polegate. It offers a great route through the countryside and Ashdown Forest. The A272, A27 and A264 head towards East Sussex. Simply follow the signs to any town in East Sussex. Gatwick Airport  services the world, it is just outside East Sussex, but you’ll see the county on the way in! there is also the smaller 'Lydd Airport' running to Le Touquet in France at the moment it is a small airport, however major expansion is expected. Lydd Airport is in Kent, but about 10km from East Sussex. To the West there is Shoreham airport (or Brighton city) which deals with mainly UK destinations. The county has a fairly good road network, with almost every destination attainable by road; traffic is a problem though, with most towns having inevitable weekday traffic. Travelling into popular destinations on a sunny Bank Holiday can prove frustrating. Brighton is the main transport hub, with the M23/A23 running North-South from London and the Brighton Mainline running parallel to it. The majority of trunk (A) roads radiate southwards from London to the East Sussex coast and can vary from dual-carriageway/motorway (M23/A23) to the more common single carriageway roads with the A22 (London to Eastbourne, via East Grinstead and Uckfield) and A21 (London to Hastings, via Flimwell and Tonbridge) though these do alternate between single and dual-carriageways where use is heavier. The majority of east-west traffic uses the A27 which runs slightly inland from Pevensey in the East past Eastbourne, Lewes, Brighton and Hove and into West Sussex travelling through Worthing, Arundel and around Chichester before forming the M27 in Hampshire. Other commonly used routes include the A26, A259 and A272. The A26 runs NE from Newhaven towards the Kent county-town of Maidstone and north of Lewes is used by the frequent Brighton-Tunbridge Wells bus service. The A259 runs along the coast of East Sussex in its entirity as the road starts in Folkestone (Kent) and crosses the Romney Marshes before entering the county and linking almost all seaside towns from Rye and Hastings in the east to Brighton and Hove in the west. The A272 is a popular route with bikers and starts in East Sussex connecting Buxted, Uckfield, Newick and Chailey before crossing into West Sussex and Haywards Heath where it continues to meander on to Winchester, Hampshire. Many of the smaller roads can offer scenic views and investing in a good quality road-map is recommended. You can expect a range of roads from those described above to single-carriageways and narrower with some locations accessible by single-track roads. Road users can also be varied as cyclists often train on the London-to-Brighton bike route (the event is in early June every year) and horse-riders and farm equipment can often be found on more rural roads. Trains from London cover the major towns in the county. National Rail  have maps covering the county with most train services currently being operated by Southern. Routes exist along the coast from Ashford via Hastings and Eastbourne to Brighton as well as from Brighton to Seaford via Newhaven. Services from Brighton also travel west towards Portsmouth and Chichester. There are two smaller spurs routing into London from Uckfield, via Crowborough and Oxted. Or from East Grinstead. There is another line from Hastings via Battle and Tundridge Wells (Kent) to London. Services from the county tend to terminate in Victoria but there are also services that route through London Bridge (from Brighton and Hastings), terminate at Charing Cross (from Hastings) and call at St Pancras (from Brighton, before continuing to Bedford). The vast majority of services terminate in South London (Westminster) with the exception of the First Capital Connect service operating from Brighton through London Bridge, Blackfriars, City Thameslink and St Pancras before continuing to Luton and Bedford. Buses are fairly good; with Buses from Brighton to Tunbridge Wells (£6.00 return), Eastbourne to East Grinstead and Heathfield in the North, Brighton and Newhaven in the West and Bexhill and Hastings in the East, as well as local routes. Traveline South East  gives more route details and routes into the surrounding counties. Essencially if there is a main road, the chances are there is a bus route along it. Most of the services in the county are provided by one of the main bus operators (Stagecoach or Arriva) with services in Brighton & Hove operated by a company of the same name (although part of Go-Ahead). Services cater for most major towns radiating into the countryside. Brighton & Hove, for example, has services covering nearby Peacehaven, Newhaven and Lewes with some services extending to Ringmer, Tunbridge Wells and Eastbourne. The Bluebell Railway, near East Grinstead, Ardingly and Uckfield. Timetable and fare information is available . The Long Man of Wilmington , near Eastbourne. Car park is open all year, 24 hours a day. A prehistoric (maybe) chalk representation of a man carved into the side of a hill. Admission to the site and car park is free. Walking on the figure or the surrounding vegetation is not permitted. Anne of Cleve's House - located in Lewes and former residence of one of Henry VIII's wives. Seven Sisters - Chalk cliffs which can be seen by walkers going from Cuckmere Haven to Seaford. Routes across the cliffs towards Beachy Head and Eastbourne are also popular with walkers. Stay well away from the cliff edge and do not sit on the edge - there have been recent incidents of cliff collapse. For more see the Stay Safe section. Ditchling Beacon - views over East and West Sussex to the north and Brighton & Hove to the south. Walkers can continue along the downs in either direction. Walkers should be aware of the road over the beacon which is popular with cyclists and normal traffic. Drivers thinking of travelling between Ditchling and the Beacon should be aware of the width restrictions (6'6") and speed limit. Expect slow moving traffic and, in the summer-time buses operating from Brighton (number 79). Caution is advised when using this road. The Cuckoo Trail from Eastbourne to Tunbridge Wells. The Forest Way From East Grinstead to Groombridge (with a on-road route to Tunbridge Wells). Abbots Wood near Hailsham has two walks, the Abbots Amble, 2.5km following yellow waymarks and Oak Walk, just over 1km following red waymarks. Beaneys Lane 'A Walk For All Seasons' 1.5km on the outskirts of Hastings through the Maplehurst Woods (Site of Special Scientific Interest), following wren marker posts between The Ridge and Stonestile Lane; mostly flat and good surface, one incline near The Ridge. Butcher's Trudge, a 2km circular walk from Butchershole near the town of Friston in Friston Forest following white waymarks. Ditchling Common Country Park Trail, located between Haywards Heath and Lewes, 1.5km long following purple waymarking. Park Wood in Hellingly (to the north of Hailsham) has a number of signed circular walks. Seven Sisters Country Park has an easy to follow path from its Visitor Centre at Exceat (on the A259 road from Eastbourne to Seaford), which goes alongside the River Cuckmere to the sea at Cuckmere Haven. Great Dixter House and Garden  (Northiam) The spectacular planting here includes topiary, exotics and some stunning colour. Michelham Priory  (Upper Dicker, near Hailsham) Features a sculpture trail, kitchen garden, medieval cloister garden and the longest medieval moat in England. Sheffield Park Garden  (near Uckfield) Originally laid out by Capability Brown, these magnificent gardens surround four elegant lakes. Battle Abbey and battlefield  1066 must be one of the most familiar dates in English history. Visit the place where it all happened. Anne of Cleves’ House  (Lewes) A 16th century half-timbered house that formed part of Henry VIII’s divorce settlement to Anne of Cleves. Newhaven Fort  Underground tunnels and interactive exhibits bring the events of wartime Britain to life. Bodiam Castle  (near Robertsbridge) One of Britain’s most famous castles, built in 1385. Some of the interior survives. Herstmonceux Castle  (nr Hailsham) A romantic moated castle surrounded by parkland. It boasts an Elizabethan walled garden and a reputation for ghost sightings. Pevensey Castle  (nr Eastbourne) Dating back to Roman times, this ancient monument played an important part in English history. Drusilla's Park is noted for its cute residents - not what you might expect in deepest Sussex! Smuggler’s Adventure  (Hastings) This labyrinth of caves is a scary smuggler’s lair. Paradise Park  (Newhaven) Discover dinosaurs, exotic plants and some fascinating Sussex history. Yesterday's World  (Battle) Step back in time and enjoy a magical journey through 100 years of British history. The Observatory  (Herstmonceux) Science comes alive at the former Greenwich Observatory. For budding Palaeontologists or anyone interested in the deep past the cliffs and exposed rocks of East sussex provide perfect hunting grounds, among the best are Hastings, Eastbourne and Seaford Discovering Fossils  have more information and recommendation's for sites, please be aware that as with any activity safety must come first! Whether it was the beautiful Sussex Countryside or their travels, writers have been drawn to East Sussex; their houses are popular tourist attractions. Hartfield Winnie the Pooh lovers will find both Pooh Corner and the Pooh Sticks bridge in this country parish in Ashdown Forest. The Beautiful countryside of East Sussex is mathced by some charming towns. Alfriston With its narrow streets and quaint cottages, this is everything an English village should be. St Andrew’s Church and the Clergy House are popular attractions, as are the numerous cafes serving traditional cream teas. Rye A delightful hillside town. Visitor attractions include antique shops, many historic buildings, and an audio ‘ghost tour’. Lewes Cobbled lanes, antique emporiums and a castle are just a few of the attractions of this pretty Sussex town. Bewl Water  (near Lamberhurst) From exciting watersports to leisurely ferry rides, there’s something for everyone at this scenic reservoir. Knockhatch Adventure Park  (near Hailsham) Home to a state of the art dry ski slope and an adventure park that the whole family will enjoy. Arlington Stadium  (near Eastbourne) Get close to the action and experience the excitement of Hotrod or Stockcar racing. Amex Stadium (just outside Brighton) This award-winning, 30,000 seater stadium hosts home matches forBrighton's professional football team, Brighton & Hove Albion, from August to May. It has also hosted internationals and will be a venue in the upcoming Rugby World Cup. Underwater World  (Hastings) A voyage of discovery to the depths of the ocean. Heaven Farm  (near Dane Hill and Chailey) Discover 170 years of farming history in the beautiful Sussex Weald. It also has a campsite. Seven Sisters Sheep Centre  (East Dean) Rare breeds and traditional crafts and are just a couple of the attractions on offer. Farm World  (Rye) Visit a real working farm and get some hands-on experience. Middle Farm  (near Lewes) A working family farm with shops, restaurant and special events. Spring Barn Farm Park  (near Lewes) A fun day out for children with a maize maze and haystack playground. Drusillas Zoo  (near Lewes) A fun day out for children with small animal zoo, indoor and outdoor play areas, train, keeper for the day and parties. Hastings and St Leonard’s There’s more to these seaside towns than the famous battle. Popular attractions include Hastings old town, the shipwreck heritage centre and flamingo adventure park. Eastbourne Stroll along the prom, amuse yourself on the pier or enjoy an ice-cream on the beach. Eastbourne is one of England’s most genteel seaside resorts. Firle Place  Home to a collection of Old Masters, including work by Gainsborough and Reynolds. Charleston  (near Firle) This quirkily decorated farmhouse was home to ‘Bloomsbury’ couple Duncan Grant and Vanessa Bell. Charleston is famous for its extravagant murals and unique cottage-style garden. Towner Art Gallery  (Eastbourne) A fine collection of 19th and 20th century British art featuring works by celebrated war artist, Eric Ravilious. Denys Church . (Rotherfield) Features stained glass windows designed by Sir Edward Burne Jones and made by William Morris. Bluebell Railway (Sheffield Park, near Fletching) Runs between Sheffield Park and Kingscote. It has the largest collection of steam locomotives after the National Railway Museum in York, and a collection of carriages and wagons unrivalled in the south of England. Lavender Line  (Isfield nr Uckfield) Mile long line between Isfield and Little Horsted. It can be reached by bus (route 29/129 not 29A or 129A) from Brighton, Lewes, Uckfield or Tunbridge Wells, ask for a ticket to 'Isfield'. Supermarkets also stock organic produce. For more details on food produced in East Sussex Sussex Food Finder  will be able to assist. 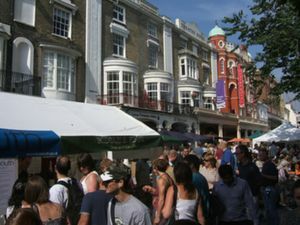 More eclectic towns such as Lewes, Brighton, and to an extent Eastbourne, have specialist dealers with organic, locally produced, fairtrade (which is increasing in popularity, with Uckfield and Lewes being named 'fairtrade towns') foodstuffs on offer. Sussex has numerous local beers and drinks, with cider being mainly produced in the east (connections with Kentish cider), Lewes houses Harvey’s Brewery  which supplies almost all of East Sussex and much of West Sussex with award winning real ale, wine is produced and with global warming kicking in Sussex and Kentish wine is being compared to Champagne (increasingly favourably), home pressed apples juice is for sale at farms and farm shops. The usual array of drinks are available at all bars and clubs, varying in price quite considerably. Loads of hotels in Brighton, Hastings and Eastbourne due to their seaside resort heritage. In outlying areas its best finding a hotel and booking it in advance, since there are relatively few, however those that do exist tend to be of good quality. The usual chains of hotels are beginning to spring up. Eastbourne This is one of England’s most famous seaside resorts. The elegant seafront is flanked by flowerbeds. Visitor attractions include parks and gardens, a thriving marina and the cliffs at nearby Beachy Head. Hastings and St Leonard’s Popular seaside resorts, surrounded by stunning countryside. Hastings also has a picturesque old town. Lewes is one of the county’s oldest towns. Attractions include the castle and Anne of Cleves’ house. Around Lewes there are many picturesque villages to visit. 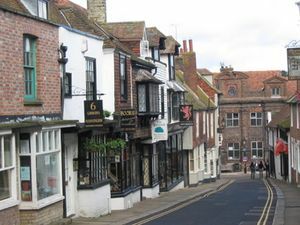 Rye and surrounding areas With its steep cobbled streets and picture-postcard cottages, Rye is a charming town. Surrounding attractions include Camber Sands and Winchelsea. Seaford is a quiet beach resort. A great base for exploring the South Downs and Seven Sisters Country Park. Individual town pages will have more information on accommodation. East Sussex has various Private schools (boarding and day) along with colleges and two universities, The University of Sussex  (Falmer, just outside Brighton) and The University of Brighton  (4 sites, 2 in central Brighton, 1 at Falmer and 1 in Eastbourne) because of the two universities Brighton has a rich, varied and exciting night life. Go for a swim: Sussex has some of the cleanest beaches in the UK, with Brighton Beach renowned for its packed seafront, less well used areas, such as Eatbourne, Bexhill and Hastings still have facilities and cleanliness. Brighton itself can be one big performance, the Brighton Festival  and the Brighton Festival Fringe  between the dates of the 3rd and 25th of May (2008) features street performers, theatre groups, musicians, guided walks and a whole host of other great activities. Posing for pictures on cliff edges is tempting but note that it can be dangerous. When walking along coastal paths do not approach the edge of the cliff or sit on the edge. The cliffs are constantly eroding due to the pounding of the sea waves, and in recent years there have been a lot of cliff falls. On 20th June 2017, 50,000 tonnes of chalk toppled from Seaford Head. In May 2016 around ten metres of cliff was lost as thousands of tons of chalk plummeted onto beach and sea. Other recent cliff collapses occurred at Birling Gap in March 2014 and Rock-a-Nore in January 2014. The RNLI advises to stay 100m away from the cliff edges and also to stay away from the cliff base to avoid chalk falls. Tunbridge Wells (on the A26, signposted from most of the country) - Victorian spa town with bars, pubs and drinking fountains for the local water, is popular in summer with locals and Londoners. Has a large shopping district/center and theaters, worth a day visit. Running from Eastbourne in the east all the way to Petersefield in the West, spanning three counties the South Downs Way is a popular walking path with numerous books and guides out there. Walking the full length is completely feasible. Depending on your skill, activity, perserverance, and need for sleep, the path can be completed as quickly as 48 hours (most people take up to a week to complete it). There are outstanding views throughout almost all of the path. Various guide books have been published on the path and its route (which is well singposted) including accommodation, food, and the local history of the areas that the path passes through. See the entries for Kent, Surrey, and West Sussex for further activities. This page was last edited on 21 June 2017, at 17:37.